Gather up all your chunky knit sweaters and cozy blankets -- Autumn is finally here! This year the autumnal equinox fell on Thursday, September 22 and brought with it the official start to this wonderful season of changing leaves, warm scarves, and crisp air. When I take some time to think about the autumnal equinox and what an equinox represents, I realize what a beautiful thing they really are. An equinox, which comes from Latin meaning 'equal night,' marks a point in the year when the day and the night are approximately the same length of time for all parts of the world. During an equinox the southern and northern hemispheres also receive exactly the same amount of light over the course of the day. For a brief moment, our world is in this wonderfully balanced, symmetrical state. This year, the autumnal equinox has me thinking more about the balance in my own life. Have I been living in a way that promotes the success of my goals, or have I been allowing life to simply pass by? Have I been making those I love a priority or have I been forgetting to nurture those important relationships? Where have have I been focusing my energies? The past or the future? One of my goals is to live more intentionally. I want to be sure I'm enjoying every moment to it's fullest; I want to revel in the purpose of life. It's easy to get caught up in day-to-day minutiae and forget appreciate the here and now and this includes the subtle shifts from one season to another. I've already checked of several things on my bucket list this year. Time to go check off even more! 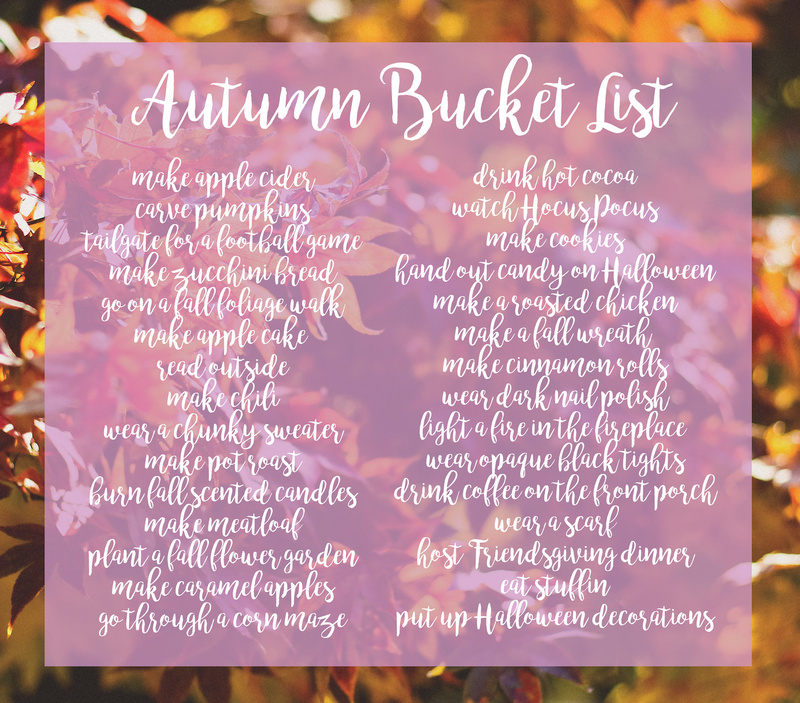 What's on your autumn bucket list this year?